A few months ago we brought out a poll asking readers of this blog what they might like to see in a revised RTL-SDR dongle. We’ve now taken some of those suggestions and implemented them into a brand new dongle. For now the price of the new dongle will remain the same as before at $24.95 USD for the dongle + antenna kit and $19.95 USD for the dongle only, but we may need to increase the price by $1 – $2 within the next few weeks due to our slightly increased manufacturing costs. Worldwide shipping remains free from the Chinese international warehouse, and US customers can order either from the Chinese international warehouse or from Amazon who will give you free shipping if you are a Prime member, or spend over $49. The Chinese warehouse is currently stocked and ready to ship, and Amazon is now stocked and should be ready to ship by the end of this week. Please go to our store page at rtl-sdr.com/store for information on purchasing. 2) Lower internal noise. Less spurs, lower noise floor etc. 3) Software switchable bias tee. No need to do any soldering to enable the bias tee. Can be turned on and off in software. We call this version three of our RTL-SDR Blog dongles. The first was version zero and was simply the standard MCX dongles with better antennas. Next came version 1 with the bias tee and SMA connector, and version two introduced the metal case. 1) Improved ESD protection on the radio front end. The BAV99 diode which is used on most dongles is not a true ESD rated diode. We have added a real ESD rated diode for better protection. The BAV99 remains in the circuit as a strong signal clipper, to prevent damage to the R820T2 from overly strong signals. Please remember that not even this will save your radio from a lightning strike, and any permanently outdoor mounted antenna system must have its own lightning protection. 2) Longer SMA connector. One or two customers had problems with the shorter SMA plugs which could not fit some of their antenna connectors. The longer shaft fixes this and also allows us to add a nut to fasten it to the aluminum body which provides a better low impedance connection (although this is not strictly needed as the PCB side ground tracks already provide a good connection). 3) Improved front end circuit. The standard matching circuit on the RTL-SDR was designed for DVB-T use, and tends to attenuate signals above ~1 GHz. The new matching circuit has less attenuation above 1 GHz and similar performance below. We used very high quality, high SRF, high Q inductors in this circuit. 4) Added a software switchable 4.5v bias tee. In previous versions of our units the 4.5v bias tee needed to be activated manually, by soldering a bridge between two pads on the PCB. However we found that many customers who want to use the bias tee do not have the skills or tools to be able to perform this mod. The new unit makes use of a low noise LDO and one of the GPIO pins on the RTL2832U to activate the bias tee in software. This of course requires a modification to the drivers, but we will shortly upload a program called rtl_biast and batch files (available now) to turn the bias tee on and off in Windows and Linux. This bias tee is great for powering a remote LNA (like Adams PSA5043+ based LNA4ALL) or something like the SpyVerter upconverter. We’ve tested it with both and found them to be running just fine. Warning: The bias tee LDO can be damaged if you short circuit it. Before turning on the bias tee, ensure the circuit to be powered is not shorted, or that the RTL-SDR is not connected to a DC shorted antenna! 5) Added several access pads on the PCB. Access pads for the unused GPIO pins, CLK in/out, 3.3V, GND and I2C pins have been added. The CLK input/output is disconnected by default (see change 6). Access pads for the I branch have also been added as some users and industrial customers are using these in special projects. These pads are only for advanced users who need them for special projects. Take care as these pins are not ESD protected. 6) Added a clock selector jumper. By soldering in a 4 pin 1.27mm pitch jumper header and removing the default 0 Ohm resistor, one can now easily select between the onboard clock, an external clock, or having the on board clock be the output for another dongle. This is for advanced users only who want to experiment with things like passive radar, and coherent receivers. 7) Reduced noise with a modified PCB design. This significantly reduces spurs and noise pickup due much lower impedance grounding and blocking of interference. Also added a USB common mode choke to reduce USB noise, several ferrite chokes on the PCB, and a lower noise LDO. A larger ground plane also improves on heat dissipation. 8) Added an experimental HF direct sampling circuit, which is diplexed out from the SMA connector. This has little to no effect on VHF/UHF operation, but allows us to make use of the Q branch on the RTL2832U chip for direct sampling, which allows us to receive from about 500 kHz to about 24 MHz. (Below 500 kHz is unavailable due to attenuation from the bias tee circuit). We used a ~10dB 50 Ohm preamp as a buffer and to overcome losses in the transformer and filter. We also added a strong 24 MHz low pass filter, and added an impedance matching transformer coil to ensure good direct sampling performance. Of course direct sampling can never be as good as using an upconverter. It can overload easily if you have strong signals since there is no gain control. And you will see aliasing of signals above 14.4 MHz due to Nyquist. But this should at least give the majority of users a decent taste of what’s on HF. If you then find HF interesting, then you can consider upgrading to an upconverter like the SpyVerter (and the SpyVerter is of course compatible with our bias tee for easy operation). We’re still classing this mode as experimental (and will be interested to hear any feedback on results), but we have had good results in our testing of this mode when receiving signals that are not too strong, getting sensitivity as good as an upconverter. We found that very good reception was obtainable with a long wire antenna and 9:1 unun combination. 9) Antenna bases now come with a stronger magnet and a conductive copper sticker on the bottom. 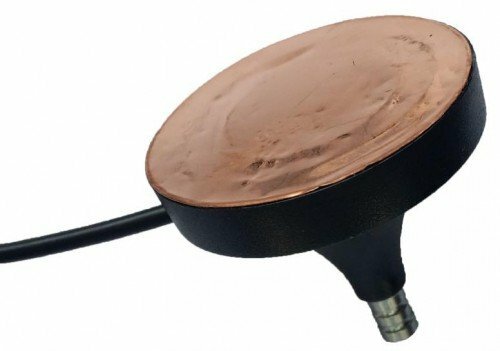 The stronger magnet adds very good stability when using our large 1.5m antenna and the copper sticker ensures that good electrical contact can be made between the base and whatever piece of metal you use underneath as the ground plane. This significantly improves the antenna’s performance as a quarter wave ground plane. 10) Added corner mounting holes for those who want to stack PCBs. Some customers have been building devices that require multiple RTL-SDR dongles, and these standoff holes should aid in stacking. 1) SMA connector – The most common connector in the radio world. Easy to adapt to other connectors and low loss over a wide range of frequencies. 2) Thermal pad – A thin thermal pad allows heat to transfer from the PCB to the metal case easily. The metal case then cools off to the surrounding air. This helps to solve L-band insensitivity problems. 3) Metal case – Helps block out interference and provides cooling. We now have a V3 users guide available which explains how to use the new features such as the bias tee, HF mode and CLK jumpers. We think that our unit is now pretty much at the peak of how good a cheap R820T2 RTL-SDR can be, so apart from minor tweaks this is likely to be our last major revision of this model of the RTL-SDR. In a 1-2 months we hope to bring out a FM bandstop filter with metal enclosure and SMA plugs with a target cost of $14.95 shipped. Further into the future we also hope to bring out supporting products like a wideband bias tee powered LNA and wideband antennas. These supporting products will of course be compatible with other SDR’s like the Airspy or SDRplay, or other RTL-SDR dongles. Where can I buy these products? All your links to Amazon state they are “currently unavailable”. https://www.rtl-sdr.com/store, shipped from China via the intl. store. For Amazon we’re still waiting for our shipment to clear customs, not sure how long they’ll take. Did it clear customs? 28 August? you’d have to use the I or Q ADCs on the rtlsdr; this one is a bit better to work with because it has pads to solder leads on for exactly this purpose. you could also use an AirSpy but you’d need an upconverter for that ($$). you could also use a higher IF (~53 MHz) (RTLSDR has a spike on multiples of 24 MHz i think) so you can use the RF input on all the mentioned sdrs instead of modifying them. I bought a v3 (2 of them actually), and the one I opened so far seems to work okay in that I can hear HF stations. audiodg is something to do with Windows, not really related to the RTL-SDR at all. Googling found some solutions relating to a memory leak https://support.lenovo.com/nz/en/solutions/ht069905, https://support.microsoft.com/en-us/help/981013/a-memory-leak-issue-occurs-in-the-audiodg.exe-process-when-you-play-audio-on-a-computer-that-is-running-windows-7,-windows-server-2008-r2,-windows-vista-or-windows-server-2008. Could also be infected with a virus, so a good virus scan might help. It turned out that the virtual audio cable driver was causing some issues, so I removed it all, reinstalled, and things are okay again. Thanks. I don’t think so, you would need someone to send you a file with all of that info already configured. So I have already damaged the end of my antenna, ( the end that plugs into the dongle ) I accidentally pulled it right off. Is it possible to order just the antenna? So I have had my RTL-SDR.com 88-108 Mhz band stop filter for about two weeks now and my RTL-SDR V3 for a couple of days. First the band stop filter, first let me say for me it is worth every penny it does exactly what it say it stops the FM band from messin with the signals I am trying to listen to. I use SDRSharp to scan through a specific band 138-144 Mhz. Without the RTL-SDR.Com the 138 to 144 Mhz band when scanning resembles something like the ocean with the wave rolling up and down, also the signal line moves up and down at the same time. This is really annoying, I have to tune down my RF gain way back to stop all of this floating and rising signals at I might add the loss off signal strength. When I attach the band stop filter all of this disappears, the signal line is very stable and no more rolling signals. I also crank up the RF gain and there is no change, great job guys. The RTL-SDR.COM V3 has given me a new toy to play with, that being the HF band. Being that this is the first time I have ever listened to the HF band I have become like a kid again, i am in there all the time. On the higher bands the V3 works perfect, I just wish I had all of this stuff (SDRSharp, DSDPlus and this dongle )when I was a kid i would have been in hog heaven. Thanks for all of your effort in making the V3 and the FM Filter, great job. Got my RTL-SDR v3 last week, haven;t had much time to play with it yet but I will make up for it this week. One think I would like to see is a longer antenna wire. I think the original is about 3 ft, should be at least 6 ft.
Hello! I am a longtime HF (shortwave radio) listener. I have many radios and two fantastic antennas (My own dipole and a pro built Wellbrook ALA 1350. I was wondering what I will need to do with this hardware other than just plug it in? I want to be able to plug it in and run! Quick question, how does the V3 dongle perform over 1300 Mhz compared to an R820t2? The V3 also uses an R820T2, but its got much better heatsinking on the PCB, and via a thermal pad to the metal case. So the L-band heat problem should no longer be an issue. We’ve had the V3 running stable for long periods without additional cooling above 1.7 GHz. Thank you, I just ordered mine without a second thought about how it would handle 1545 or 1090 Mhz frequencies. So all I have to do when I get my v3 rtl-sdr dongle is plug it into my computer attach an inside or out antenna and I am good to go? And if I want to use it for HF I would just change SDRSharp to Direct sampling ( Q branch ). I am not really sure what the bias tee is for and I definitely don’t want to short the dongle out. Any info would be appreciated. You’ll need to go through the quickstart guide first which is at https://www.rtl-sdr.com/qsg. Then after attach an appropriate antenna and you’re good to go. Yes to Q-branch for HF, and you’ll need an HF antenna. The bias tee is for powering a remote device like an LNA, or active antenna. If you don’t need it just don’t turn it on, and it won’t affect you. Shorting the bias tee would only damage the bias tee and not the dongle itself anyway, plus the newer ones shipping now have a resettable fuse in place which makes it very hard to damage anything. Is it possible to add a bias parameter in the osmocom driver like for the AirSpy source ? Hello. Today I received in Madrid – Spain my RTL-SDR V3 dongle but the USB is folded or broken. I took photos after opened the plastic bag. I need a new one ASAP. Please email us at rtlsdrblog_AT_gmail_DOT_com and send your order info. If you could send the pictures too that would be great. September 8, 2016 - 5:25 pm Rob T.
With regard to not damaging the LDO by accidentally connecting a shorted antenna, would it be possible to use a PTC or something similar to protect it? (I’m not an EE, just a software person, so this could be a dumb question). Yes a PTC fuse can help. RF2 is a good place to add it (replace the previous component). For me the ADSB reception improvement is huge, so I’m really happy with it! Thanks for the mini review! Remember that increasing L13 will degrade performance in the UHF band though. That’s the trade off we made, undisturbed UHF and L-band performance instead of reception below 500 kHz. We could have made a lumped bias tee, but the component count increases too much, making it expensive, plus there’s not really enough space on the board. Interesting that there is so much difference between the ‘birdies’ in your RTL-SDR dongle and the NeSDR. I suspect the balun on your USB wires made quite a difference. Take a look at the 480MHz spectra of the two, your dongle is much cleaner. I think what might actually work well is the 47uH in series with the default inductor. That shouldn’t cause a large dip since the inducrances aren’t so far apart then. Yep the common mode choke was designed to reduce USB noise, and it does this well. Check out the 480 multiples as well. How did you get the 12dB NF? Is it the overall NF to the SNR in the AF channel? I got a different result. Best sensitivity appears to be at 5MHz. Do you have a (partial) schematic? To measure NF I used a Noise Generator which generates 22dB of thermal noise at that frequency, then used an attenuator to increase the total received noise by 3dB. Below 5MHz the inductance of the 6.8uH tee-isolation inductor starts to reduce performance, it is absorbing 5dB of signal by 500KHz. The schematic is pretty obvious once you start probing the board. The LNA chip is similar to the SGA1263. V3: So, you measured the NF=12dB with your modified LNA? Additional gain of 5dB will verify my results. It is very tedious to design a duplexer for such wide frequency bands. The designers did a marvelous job. They managed to realise a good input match and a reduced NF (-1.5dB) at VHF/UHF with some emphasis on the 2m and the 70cm bands. A more basic design would be to use a RF switch or a second input connector. I will further follow a concept of a simple switch isolating the HP part during HF operation. And adding some additional gain to bring the NF down and replace the transformer by a symmetrical output amplifier. 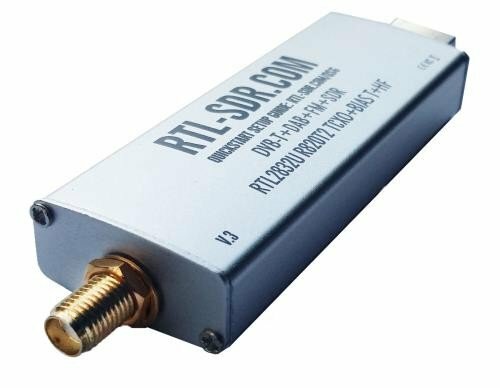 The new RTL-SDR V3’s came out and I’m not going to lie, I’m a little salty I bought three of the older ones now over the past three weeks. These units are much more versatile. If I would have known I would have waited. Sorry you feel that way. We announced that the new unit was coming soon in a July 11 post, and put the V2 units on sale. It’s tough to know when to announce the new units as we don’t know for sure how long production, testing and shipping will take as there’s always unknown problems that can pop up. If we announce it too early, people get angry because its delayed. Too late, people get angry because they just bought older units. It’s hard to balance and I think if we worry too much about pleasing everyone then it becomes less likely that we will continue to improve the units. If anyone has any advice on how to handle similar situations in the future please let us know. It’s probably more to do with the resonance of the RF block inductor and the output stability capacitor of the bias tee LDO. To improve below 500 kHz and keep the bias tee you could increase the inductance of the bias tee RF block inductor to something like 10 uH or much higher, but then this would degrade the performance at the UHF range due to the lower SRF of a larger inductor. The amp is mainly to overcome the losses in the impedance transformer and to act as a buffer to ensure the VHF/UHF circuit isn’t disturbed. There’s a ~5dB attenuator after the amp & filter to reduce the gain to prevent overload on strong signals. If you wanted more gain you could try removing that, but I doubt that the extra gain will even help improve SNR as it will just raise the noise floor along with it. Later this week or next week. I don’t think there’s much to really show in the comparison apart from a slightly lower noise floor and less/lower clock spurs. The main changes in V3 are to the feature set. Question about the direct HF conversion. I’m running SDR# 1457, and just got my v3 yesterday. I didn’t see anything in HF, so I put the same antenna through my Ham-it-up upconverter and into the v3. After applying the -125MHz offset value in SDR# I had lots of signals in the AM broadcast band as well as shortwave. So, am I missing something or is that particular version of SDR# not enabling the direct sampling channel? Did you enable the Q branch in SDR#? That did it. Thank you!!! Actually better performance than through my ham it up! Great! By the way, there is a V3 users guide here https://www.rtl-sdr.com/rtl-sdr-blog-v-3-dongles-user-guide/. Explains how to use the new features. If this happens to you please contact us on Amazon. Sometimes they find old stock hidden in a corner in their warehouse somewhere which should have already been sold out, and then they mistakenly mix it in with the new stock. It’s rare but it can happen. Contact us on Amazon for a replacement. Would you mind sharing what ESD protection diode you are using? I keep killing LNA4alls with stray ESD during storms. Was going to put a BAV99 on the input but if there’s something better and readily available I’ll use that. Fantastic work BTW. I find it interesting comparing your work to kickstarter projects which take years of work and lots of funding. I can’t share the part number, but its a simple bidirectional ESD rated TVS diode, there are many on the market on digikey etc. If it keeps getting destroyed during storms you might also want to look into gas discharge tubes and grounding your antenna better, maybe adding a static bleed resistor. Ideally the ESD should be already gone by the time it gets to the LNA4ALL. Hi guys, would it be possible to unsolder the bias t circuitry to help with tuning lower than 500KHz? If so, where does one start the unsoldering operation? Yes you could try, all you’d need to do is remove L13 which is the bias tee inductor. That will probably get you down to around 100 kHz, maybe lower. A way without modification might be instead to boost the signal so that the loss through the inductor is not so bad. Maybe an LNA4HF + a LPF filter would work. Hi again, any chance on upping the bits a bit? Like to 12 or 16 in some glorious new future model?? Yes that would be a totally new device, and definitely a considerable amount more expensive :D. The Airspy SDR dongle pretty already has this upper level sorted anyway. Is the Elonics E4000 really impossible to fabricate anymore? It had a really nice high frequency despite the gap in the L-band. But I will definitely be getting this for my HF needs. I’m not really willing to get an upconverter, so if I don’t have to, I’ll gladly not. The E4000 is gone unless someone buys the IP and starts manufacturing it again, which is pretty unlikely I think. An upconverter will get you better HF performance than DS, but DS should be enough to satisfy most people. Outernet has managed to find a couple of thousand to build there L-Band receivers. I bought a DIY kit from them and mine clearly comes up as a E4000. They are selling them on Amazon with a really nice filter for around $50. Yep Outernet has bought from NooElec who have the majority of E4000 stock. It’s gotta run out at some point though, but who knows, they might have tens of thousands of chips left over. Could you please show us some diagrams and photos of your successful antenna experiments with the HF direct sampling mode in use. What type of diagrams are you interested in? The connection scheme is simply: Dongle -> 9:1 UNUN or BALUN -> Longwire antenna. The longwire was thrown over the roof of a suburban house. The unun/balun was a cheap one from eBay http://www.ebay.com/itm/100K-50MHz-RTL-SDR-Supporting-long-Antenna-9-1-Impedance-Transformer-Balun-BNC-/172153360141?hash=item281523cf0d:g:5vUAAOSwvg9Xarmd. Nooelec also sell a good 1:9 balun. Scroll down to the preselectors section(s) at left. Yep a preselector or antenna tuner will help a lot if you have them. But the 9:1 is very cheap and will at least get you somewhere in the range of the correct impedance. If you want to run Q Branch direct sampling in Linux GQRX here is a reply I got from the GQRX forum written by Alexandru Csete. This works great on my Soft66Q HF RTL from Japan in Q mode. I’m adding the support for the Bias T of the V3 Dongle at librtlsdr repository (we made a fork in github because the main one is some patches behind). I did not received (yet) my V3 dongles, but I will test it as soon as it arrives. About the CP Mod, I will try to simulate the problem and check your branch to see the fixes. This part for the RT8XX we changed some stuff related to the Bandwidth filter (in our branch you can select it manually) so the init function is different. So I will try with more care. I have a question about direct sampling . How are you doing that , RF transformer and if so , what is the turns ratio ??????????????? We’re using the unused Q-branch ADC pins in the RTL2832U. The HF signal is diplexed out from the input, goes through a ~10dB amp buffer, then into a LPF, then into a mild attenuator, then into the transformer. The transformer has 16 turns. We tested 4, 9 and 16 turns. 4 turns was okay, but 9 and 16 turns gave slightly higher SNR. The difference between 9 and 16 turns was almost negligible. The HF circuit was not at all expensive to add, so we thought why not put it in and make use of those ADC pins that are just sitting there doing nothing. Amazing work you guys are doing. Can’t wait to get my hands of the v3 edition. You guy’s do so much for the community. I love the site and love the dongles. Went to the shop to buy via the Chinese warehouse but it came up as 17.99 not 19.99. If I continue, can I guarantee to get sent the v3 our am I trying to buy too early? We only have v3 in stock now. There was a brief period where the cart bugged out and showed the old sale price, but it’s fixed now. What about a comparison between V2 and V3 dongle relative to less spurs, less noise, performance in general ? We’ll be adding a comparison post in the next few days. Basically a lot of clock spurs have been reduced significantly and USB noise at 480 and multiples is much lower now. Noise floor is also lower at some frequencies. I’ would like to see a LNA (Low Noise Amplifier) with RF-Bypass capability. Switch bias ON – LNA works. Switch bias OFF ==> RF Signal pass through the Amplifier and can be INLINE in the Antenna Cable. Maybe only possible with a very small RF-Relay on the LNA-PCBs. A LNA at or in the receiver is a pretty poor choice. A LNA after all noise has entered the system is not going to help you very much. You want the LNA as far away from the receiver to get the maximum benefit from it. So that it can amplify the signal above the level of the additional noise that will enter from the system of cables and connectors on the way to your receiver. You also have to remember that noise and signal are both amplified by exactly the same amount. So having the LNA as the last stage will do very little to improve the signal to noise level of the modulate signal that you are interested in receiving. for sure, the LNA needs to be close as possible to the antenna. but i want to switch on, only when needed. when the lna is switched off, the rf signal from the antenna should pass to the LNA without amplification. RF Bypass when not switched on. Sorry, I picked up what you meant the wrong way. I failed to understand that you meant a totally new independent LNA device, which has functionality equivalent to a dual pole relay switch. That when powered on, it moves a short circuit out of the way to be replaced by a LNA. And when power is removed the LNA swapped out and replaced by a short circuit. But a device created using solid state chips instead of a relay which would waste far too much power. Good idea! Actually this is the idea for one of the LNA models that we’re already working on and prototyping right now. We find that the RF relay degrades the NF by 1-2 dBs over the range (unless we use a high grade $20 USD relay), so we’ll probably have two models, one with the relay and one without. I’m lucking for some more Filter, not only a FM-Bandstop, maybe a tunable notch filter or a DAB Bandstop (175-230MHz) Filter. We have very strong DAB+ and DVB-T Carriers in Europe. The fact that I just bought your V2 units last month makes me regret not holding off for V3. Of course when you don’t say when you’ll release V3, until now–surprise, should I fork over my money for the V3 dongle, and a better antenna base (although I am still using the one that I got from another RTL-SDR dongle in which it has smaller base, but much much powerful mangetic base)? Is it worth it to get a complete new set of SDR kit from you guys? If the V2 is doing everything you need it to already then there’s no need to upgrade to the V3. If you want it mainly for HF then it would probably be better to spend your money on the spyverter instead. On July 11 we posted that we were a few weeks away from releasing the new version and we also put V2 units on sale. I think that’s a fair enough time frame. You are certainly right about me being impatient, especially when I want the unit just before I leave out of ststate so I can take it with me to explore spectrum in Washington. Just one more question… do you think some time in the future Youssef Touil from Airspy who makes SDR# can add the Bias-Tee checkbox within the RTL-SDR Controller window for those of us who will have the V3 units, or will it be strictly kept to the batch file that we have to run each time just to turn on/off the bias-tee? Yep Youssef is kindly helping us to add a checkbox and this will be ready at some point soon, but for now just the batch file or rtl_biast program. I’m in the same boat. Bought a couple of V2s not long ago. While it would be nice to have fewer spurs (I already have a spyverter for HF) I think I’ll stick with these for now. It is good to see the product being continually improved though. Well done.